This item is 9 years and 7 months old; some content may no longer be current. Eczema can have a significant impact on the lives of patients and their families. The aims of treatment are to identify and minimise exposure to irritants, maintain the barrier function of the skin using emollients and use anti-inflammatory treatment to control exacerbations. Do skin prick tests, RAST tests or patch tests have a role in diagnosing allergies? There are two main theories about the pathogenesis of eczema. The more traditional view is that eczema is primarily an immune mediated response to environmental factors.2 However recent research suggests that skin barrier defects play a key role. These defects arise from gene mutations and result in loss of function of structural proteins e.g. filaggrin.3 It is most likely that eczema arises from a combination of both genetic and environmental factors. Most cases of eczema first develop in children aged under five years and about one in six school children have some degree of eczema. However, in about two thirds of cases, by the mid teenage years, the flare-ups of eczema have either gone completely, or are much less of a problem. It is unusual to first develop eczema after the age of 20, although eczema may go into remission in childhood and reappear in adult life. There is no way of predicting which children will be affected as adults. Eczema can impact on career choice. A teenager with eczema should be aware that hair dressing, nursing, cooking and cleaning jobs, for example, are associated with a high risk of chronic hand dermatitis. People with eczema who work in the food, hospitality and health industries may find that their occupation adversely influences their eczema, and that they may not be able to work if they have visible eczema, particularly if it is infected. The diagnosis of eczema is usually based on the presence of an itchy rash in addition to a history of atopy and dry skin (see Box 1). Referral to a specialist may be required for severe eczema or eczema that fails to respond to appropriate treatment. 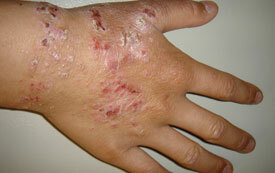 Urgent referral is required if eczema herpeticum is suspected. This is a severe form of herpes simplex virus infection in a patient with atopic eczema which presents as rapidly worsening, painful plaques, clustered vesicles or punched out erosions.7 It is often associated with fever and malaise. The role of airborne allergens such as house dust mites and animal dander in causing eczema is unclear and total elimination of these triggers can be difficult, time consuming and costly and may have limited benefit.6 However, using mattress covers, low-pile carpet and minimising exposure to pets may be trialled, especially for children who also have asthma and/or rhinitis.9 Cigarette smoke should be avoided. For correspondence regarding use of emollients in eczema, see "Correspondence: Is aqueous cream an appropriate leave-on emollient? ", BPJ 34 (February, 2011). Application of emollients three to four times daily (or more) is ideal, however this may be difficult. For most people regular once a day application is achievable and can still lead to improved outcomes. Emollients are best applied after bathing or showering while the skin is hydrated. Best practice tip: Initially prescribe a selection of emollients to allow the patient to choose the one that suits them best. In New Zealand, funded options include aqueous cream, fatty cream,* emulsifying ointment and cetomacrogol cream. Partially funded options include oily cream, glycerol with paraffin and cetyl alcohol (QV lotion) and wool fat with mineral oil (Alpha-Keri, Hydroderm BK and DP lotions). Urea cream (Nutraplus) is very effective at moisturising dry skin, but may sting if there is active eczema. * Lemnis Fatty Cream has been discontinued. healthE Fatty Cream has the same formulation as Lemnis Fatty Cream and is now fully funded. N.B. Lemnis Fatty Cream HC (hydrocortisone) is still available. Despite efforts to avoid irritants and the best use of emollients, flares are characteristic of eczema. Topical corticosteroids are the main agents used to control flares. As the intention is to use them short-term, they should be applied in appropriate amounts to all affected areas to gain rapid control. 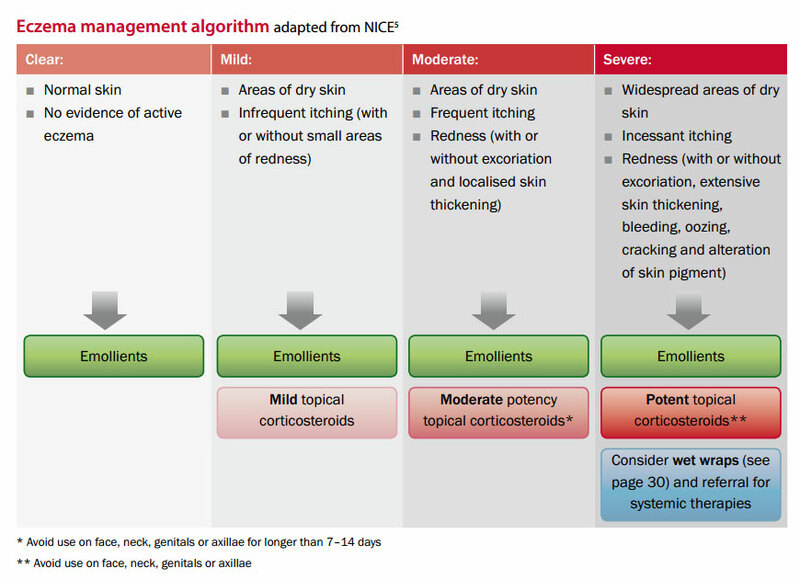 See here for information on the use of topical corticosteroids including their indications, potencies, adverse effects and precautions. In general the potency of steroid should be matched to the severity of the flare.5 For mild flares use a mild steroid, for a moderate flare use a moderately potent steroid and for a severe flare use a potent steroid. Treatment should continue until the flare has resolved. Emollients need to be continued during flares and for maintenance. Pimecrolimus (Elidel) - is there a place for this? Yes: For use on sensitive areas e.g. eyelids, groin if hydrocortisone is being used continuously, or is not effective, on these areas. No: if cheaper low potency topical corticosteroids are proving effective or where it is safe to use more potent topical corticosteroids. For these reasons, topical corticosteroids are still considered the first line treatment for eczema. Pimecrolimus is not currently subsidised – a 15 g tube costs approximately $50. 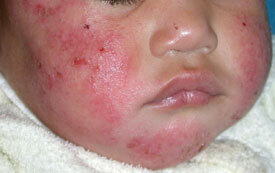 Potassium permanganate is an antiseptic that is sometimes used to treat eczema that is weeping or has become infected. Potassium permanganate crystals can be added to bath water at a concentration of 1:10000 (dissolve a few crystals in a container of water until a light purple solution is formed and then add to bath water, which should turn light pink). However the solution may cause brown staining to the skin and nails not to mention the bath so this method has fallen out of favour. Adverse effects that may occur, especially with incorrect or excessive use, include maceration of the skin or secondary infection. Cover with the damp dressing and then cover this with the dry dressing. Plastic is not a suitable alternative to the dry dressing as it is too occlusive and may be a choking hazard. Referral to a dermatologist for allergy tests may be appropriate for eczema that has a poor response or failed to respond to conventional topical treatment, or where dietary precipitants are suspected.20 Commonly used tests for allergies include patch test, skin prick test and radioallergosorbent test (RAST). Patch testing is used in the investigation of suspected allergic contact dermatitis. It is mainly indicated where eczema is confined to a specific site e.g. only the hands or face. Patches containing standardised allergens are applied to the upper back and tape is used to keep them in place for 48 hours. It is then “read” at various time intervals looking for evidence of an eczema-like rash, that might indicate sensitivity to a particular allergen. Skin prick testing is used to detect the presence of allergen specific IgE to food, aeroallergens, some venoms, antibiotics and latex.20 Drops of commercially produced allergen are placed onto a marked area of skin on the forearm or upper back. Using a sterile lancet, a small prick to the skin through the drop is made. If the patient is allergic a small lump will appear at the site of testing over 15 – 20 minutes. This is not an eczematous response, so its relevance to eczema is unclear. RAST testing is a blood test that measures the level of specific IgE to different allergens and is used to investigate increased sensitivity to a variety of food groups (e.g. eggs, cow’s milk and nuts), house dust mite and animal dander. In atopic eczema the results of RAST testing may be misleading. It is often used in the investigation of patients with atopic eczema however, a patient can have a degree of sensitivity to many allergens but not all will have a clinically significant effect on their eczema. Children and adults with severe or persistent eczema should be referred to a dermatologist and may also require paediatric and/or immunology assessment. Other second line treatments used in specialist practice include narrowband ultraviolet-B (UVB) phototherapy and immunosuppressive agents, especially methotrexate, azathioprine and ciclosporin. These agents necessitate regular review and careful monitoring. Ross T, Ross G, Varigos G. Eczema. Practical management issues. Aust Fam Physician 2005;34(5):319-24. 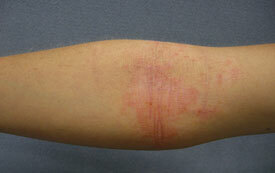 Weston WL, Howe W. Epidemiology, clinical manifestations, and diagnosis of atopic eczema. UpToDate 2008. Available from: www.uptodate.com (Accessed July 2009). Cork MJ, Danby SG, Vasilopoulos Y, et al. Epidermal Barrier Dysfunction in Atopic Dermatitis. J Invest Dermatol 2009; Epub ahead of print. Faught J, Bierl C, Barton B, Kemp A. 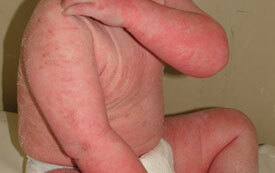 Stress in mothers of young children with eczema. Arch Dis Child 2007;92:683-6. National Institute for Clinical Excellence (NICE). Atopic eczema in children: management of atopic eczema in children from birth up to the age of 12 years. 2007. Available from: www.nice.org.uk (Accessed July 2009). National Prescribing Centre. Atopic eczema in primary care. MeReC Bulletin 2003;14(1). Clinical Knowledge Summaries. Eczema - atopic 2008. Available from: http://cks.library.nhs.uk/eczema_atopic (Accessed July 2009). Weston WL, Howe W. Treatment of atopic dermatitis (eczema). UpToDate 2009. Available from: www.uptodate.com (Accessed July 2009). Krakowski AC, Eichenfield LF, Dohil MA. Management of atopic dermatitis in the pediatric population. Pediatrics 2008;122:812-24. Anderson PC, Dinulos JG. Atopic dermatitis and alternative management strategies. Curr Opin Pediatr 2009;21:131-8. Australasian Society of Clinical Immunology and Allergy. Atopic dermatitis, 2007. Available from: www.allergy.org.au/content/view/158/300/ (Accessed July 2009). Grimalt R, Menheaud V, Cambazard F. The steroid-sparing effect of an emollient therapy in infants with atopic dermatitis. Dermatology 2007;214:61. Drug and Therapeutics Bulletin. Bath emollients for atopic eczema: why use them? Drug Ther Bull 2007;45(10):73-5. Bath-Hextall F, Williams H. Eczema (atopic). Clin Evid 2006;07:1716. National Prescribing Service. Pimecrolimus cream (Elidel) for facial atopic dermatitis. NPS Radar, 2006. Available from: www.nps.org.au/health_professionals/publications/nps_radar (Accessed July 2009). Brown S, Reynolds NJ. Atopic and non-atopic eczema. BMJ 2006;332:584-8. Stewart D. Eczema. Starship Children's Health Clinical Guideline 2005. Available from: www.starship.org.nz/Clinical%20Guideline%20PDFs/Eczema.pdf (Accessed July 2009). Ngan V. Wet wraps. DermNet NZ 2009. Available from: www.dermnetnz.org/procedures/wet-wraps.html (Accessed July 2009). Robinson M. Allergy testing and referral in children. Aust Fam Physician 2008;37(4):210-3. Stanway A. The causes of atopic dermatitis (eczema). DermNet NZ 2004. Available from: www.dermnetnz.org/dermatitis/atopic-causes.html (Accessed July 2009). This article is 9 years and 7 months old.